(The Lone Spaceman), was drawn in a lush, illustrative style reminiscent of Flash Gordon's Alex Raymond or Prince Valiant's Hal Foster. United Feature Syndicate (Li'l Abner, Gordo, Fritzi Ritz) launched Casey Ruggles as a Sunday-only feature on May 22, 1949. It was well received, and a daily followed on September 19 of the same year. Like most western heroes, Casey was a two-fisted adventurer (in his case, an ex-sergeant of the U.S. Army) with a habit of encountering beautiful women wherever he went. His adventures were set in California, during the early years of the Gold Rush. Contemporary personages whose paths he crossed include politicians such as Millard Fillmore, entrepreneurs such as Henry Wells and William G. Fargo, and fellow adventurers such as Kit Carson and Jean Lafitte. The influence of earlier newspaper cartoonists like Raymond and Foster was obvious in Tufts's work. Less obvious, but considered more important by the artist himself, were storytellers like Mark Twain and Brett Harte. He also absorbed the story sensibilities of the other popular media of the time, movies and radio shows. If anything, his work was too good, as his perfectionist ways caused him to miss deadlines despite spending more than 80 hours a week working on the strip — and despite the help of many assistants and ghosts, including Nick Cardy (Teen Titans, Bat Lash), Edmond Good (Dagar, Desert Hawk; Johnny Law, Sky Ranger), Ruben Moreira (Roy Raymond, Tarzan), Al Plastino (Superman, Terry & the Pirates) and Alex Toth (Green Lantern, Zorro). In 1954, he had a falling out with United Feature (reportedly over a proposed TV version that the syndicate vetoed), and left his creation behind. Casey Ruggles was taken over by Al Carreño (who had credits at Fawcett Publications, Quality Comics, Fox Feature Syndicate and many other 1940s comic book publishers). Readers apparently didn't take to the change, as the strip bit the dust during October, 1955. 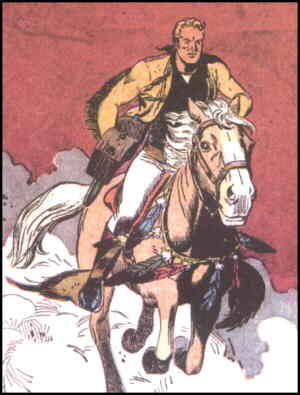 Tufts formed his own syndicate, through which he distributed a couple of subsequent strips — one of which, Lance, another western, is as highly regarded as Casey Ruggles. After Lance folded, he did western comic books for Dell Comics, followed by a lengthy run on Gold Key's Pink Panther title. But his heart wasn't in the comic book work, and he left the comics field altogether. He died in 1982. Today, the Casey Ruggles strip is as well-remembered by aficionados of newspaper comics as it is forgotten by the general public. It's occasionally reprinted by specialty publishers such as Pacific Comics Club, or in specialty magazines such as Comics Revue, but has had no other media spin-offs. Text ©2003-10 Donald D. Markstein. Art © United Feature Syndicate.